History - Carl Stahl - løftegrej, stålwire, kædesæt, rundsling m.m. Carl Stahl A/S was established in Denmark in 1999, and has since then developed to become one of the largest distributors of lifting equipment for the Danish market. The company employs more than 40 employees, with divisions in Fredericia (head quarter), Taastrup, and Rødby. Furthermore, the company provides services to its customers with mobile service located in cities across the country. Carl Stahl A/S is the Danish subsidiary of the family owned Carl Stahl Germany. At present, the company is the largest supplier of lifting equipment and wire technic in Europe, with subsidiaries worldwide. 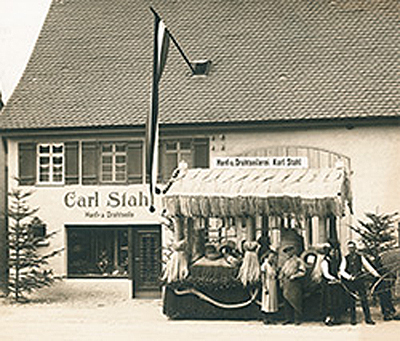 In 1880, the company was founded by Jacob Stahl as a traditional rope making shop in Sussen, east of Stuttgart. Jacob Stahl manages the company up until 1904 when his son Carl Stahl takes ownership of the Company. In 1930, Jacob Stahl’s grandson, Carl Stahl, inherits the ownership of the company. Rope and worsted is primarily produced at the time. However, the production is expanded in a short period of time to include slings. When Carl Stahl’ son in law, Villy Schwenger, enters the executive board in 1966, the company expands considerably. From the 1970s up until now, the company has developed into Europe’ largest and one of the leading supplier of lifting equipment in the world. Today, Carl Stahl has more than 1,500 employees worldwide and operates from subsidiaries in more than 20 countries in Europe, North America, the Middle East, and Asia. The company remains family owned to this day.